Macrosiphum euphorbiae apterae are either green with a darker green longitudinal stripe or red (see pictures below), and often rather shiny. Their eyes are noticeably red, and the antennae are darker towards their tips. The fused apical rostral segment (RIV+V) is 0.83-1.02 times longer than the second hind tarsal segment (HTII) (cf. 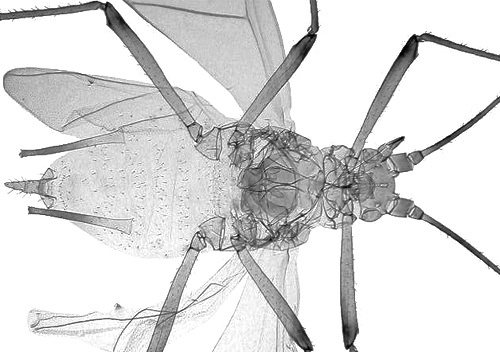 Macrosiphum tinctum for which RIV+V is 0.98-1.11 times longer than HTII and cf. Macrosiphum funestum for which RIV+V is 1.2-1.5 times longer than HTII). Their femora are brownish and rather pale with the apices not dark or only slightly so (cf. Macrosiphum hellebori, Macrosiphum gei, Macrosiphum cholodkovskyi and Macrosiphum euphorbiellum which all have dark apices to the femora). The siphunculi are pale sometimes with the tips darker, but not as dark as the tips of the tibiae (cf. Macrosiphum rosae which has the siphunculi entirely black). The siphunculi are reticulated on the apical 13-20% and are 1.7-2.2 times the length of the cauda. The cauda is rather pointed and not constricted. The body length of Macrosiphum euphorbiae apterae is 2.0-4.0 mm. The alate (see third picture above) has pale greenish to yellow-brown thoracic lobes, with only the antennae and siphunculi noticeably darker than in the apterae. 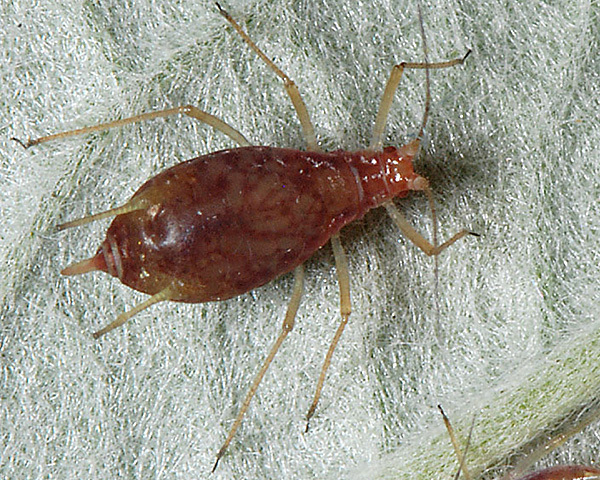 The clarified slide mounts below are of adult viviparous female Macrosiphum euphorbiae : wingless, and winged. 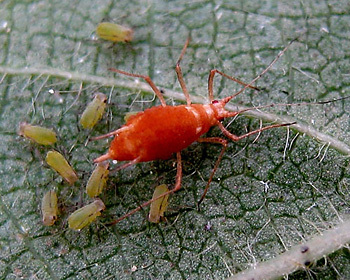 The potato aphid is a common and highly polyphagous species. It is often a pest on various crops such as potato (Solanum tuberosum), lettuce (Lactuca sativa) and beets (Beta vulgaris) as well as on numerous garden ornamentals. Macrosiphum euphorbiae is a vector of about one hundred plant viruses. The species originates from the north-eastern USA where it produces sexual forms and host alternates with rose (Rosa) as its primary host. Elsewhere it usually overwinters as viviparae. 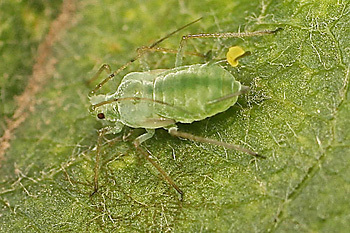 Aphid numbers increase rapidly from early spring, and alates spread infestations to other plants. It is an especial problem in unheated greenhouses. Macrosiphum euphorbiae was introduced to Europe about 1917 and is now cosmopolitan. Macrosiphum euphorbiae is only known to use Rosa species as a primary host (specifically, for sexual reproduction) in north-eastern USA. In addition (there and elsewhere) Macrosiphum euphorbiae reproduces parthenogenetically on Rosa species, including cultivated roses. 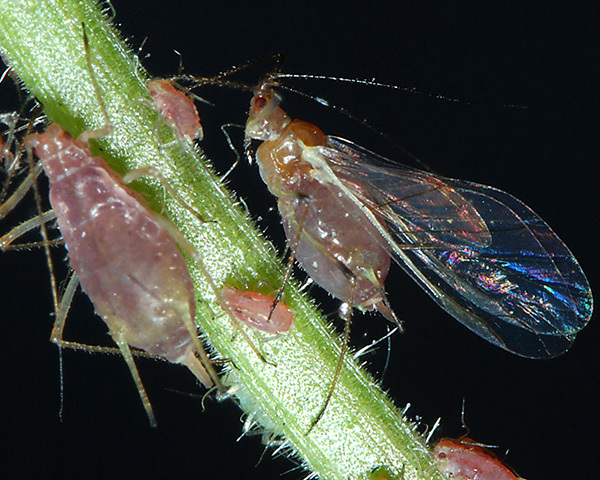 For an aphid species list see our rose aphids page. Macrosiphum euphorbiae has been recorded on 14 Rosa species. 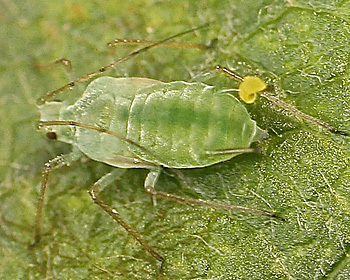 Of those aphid species, Baker (2015) lists perhaps 21 as occurring in Britain: Acyrthosiphon malvae, Aphis craccivora, Aphis fabae, Aphis frangulae, Aphis frangulae ssp. 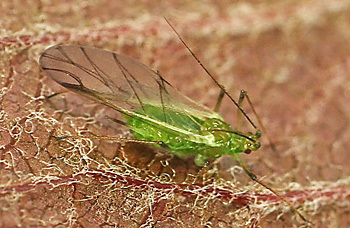 beccabungae, Aphis gossypii, Aphis nasturtii, Aphis solanella, Aphis spiraecola, Aulacorthum solani, Brachycaudus helichrysi, Macrosiphum euphorbiae, Myzus antirrhinii, Myzus ascalonicus, Myzus ornatus, Myzus persicae, Neomyzus circumflexus, Pemphigus sp., Rhopalosiphoninus latysiphon, Rhopalosiphum rufiabdominale and Smynthurodes betae. Blackman & Eastop list 22 species of aphid as feeding on beets (Beta vulgaris) worldwide, and provide formal identification keys. 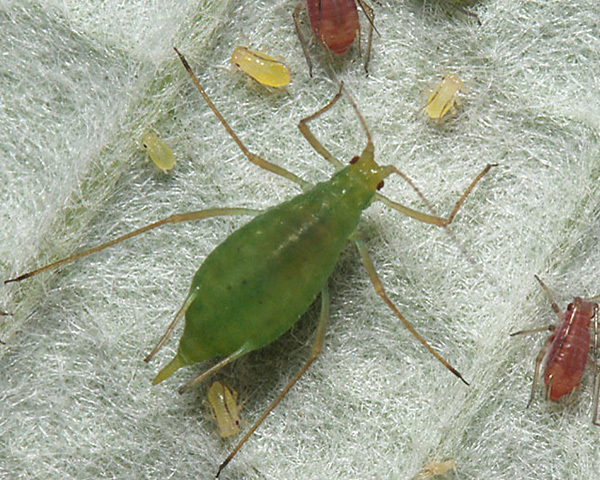 Of those aphid species, Baker (2015) lists 18 as occurring in Britain: Aphis craccivora, Aphis fabae, Aphis gossypii, Aphis nasturtii, Aphis sambuci, Aphis solanella, Aulacorthum solani, Brachycaudus helichrysi, Brevicoryne brassicae, Hayhurstia atriplicis, Macrosiphum euphorbiae, Macrosiphum stellariae, Myzus ascalonicus, Myzus persicae, Pemphigus fuscicornis, Rhopalosiphoninus latysiphon, Rhopalosiphoninus staphyleae ssp. tulipaellus and Smynthurodes betae. Just sorting out pics, and have happened upon these little lovelies from November, which I've been unable to which I've been unable to put a name. They were on cotton growing in the Mediterranean Biome at the Eden Project. Are you able to help?! Image(s) copyright Sally Luker, all rights reserved. Had a look at your aphids on cotton. The adult appears to have been killed by an Entomophthora fungus giving it the bright orange/red colour. 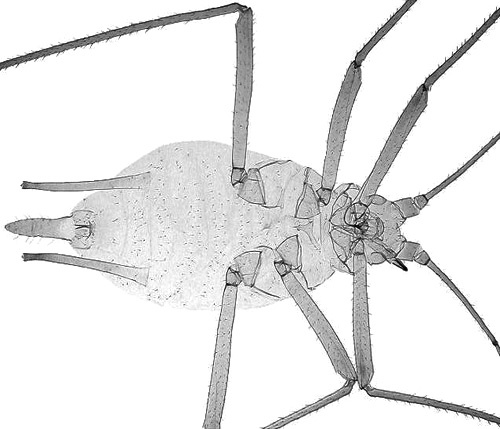 This aphid fits all the requirements of Macrosiphum euphorbiae: antennal tubercules high smooth and divergent, femora rather pale with the apices not dark, siph pale with the tips darker and the cauda rather pointed and not constricted. (E.g. see our Macrosiphum page) It is recorded on Gossypium herbaceum by Blackman. I was actually wondering about fungification but the aphid didn't seem in too bad a shape, so I casually dismissed that, which left me unnecessarily pondering - that'll teach me! I came across a dead ringer (I think!) for a species that I found the other day, 31 May 2014, on Pear (Pyrus communis cv) at Langford Garden Centre, Beds. The 'match-images' purport to be Macrosiphon euphorbiae, though they look rather different to your own and other images of this and the other day I had rejected this as a possibility! They were in fact from the 'Azoresbioportal' website! I normally try to avoid getting too involved with on-line images of many insects as so many are clearly wrongly identified (as also many of fungi!). Any suggestions? Looks like Macrosiphum euphorbiae - first two are IV instar future alates.